Manufacturing sales increased 1.0% to $57.1 billion in January, following three consecutive monthly decreases. Sales rose in 15 of 21 industries, representing 55.9% of total manufacturing sales. Higher sales in the food as well as the electrical equipment, appliance and component industries were the main contributors to the gains in January. In volume terms, manufacturing sales rose 1.4%. Food manufacturing sales rose 2.8% to $8.8 billion in January, following a 2.1% decline in December. The advance in January mainly reflected higher sales in the meat product; grain and oilseed; and other food manufacturing industries. After removing the effect of price changes, sales volume increased 2.4% in the food industry. Sales in the electrical equipment, appliance and component industry rose 13.0% to $1.1 billion, following a 0.2% decline in December. The increases in this industry were widespread and reflected higher volumes. In constant dollars, sales in this industry were up 12.9%. Increases were also seen in the wood product (+3.4%) and motor vehicle parts (+3.0%) industries. In constant dollars, volumes sold increased by 3.2% and 3.3% respectively in these industries in January. Partially offsetting these increases were a decline in production in the aerospace product and parts industry (-12.4%) and lower sales in the paper manufacturing industry (-2.7%). Sales were up in eight provinces in January, led by Ontario, New Brunswick and Alberta. Increases in these three provinces were largely responsible for the total national gain. Sales were down in Quebec and Newfoundland and Labrador. 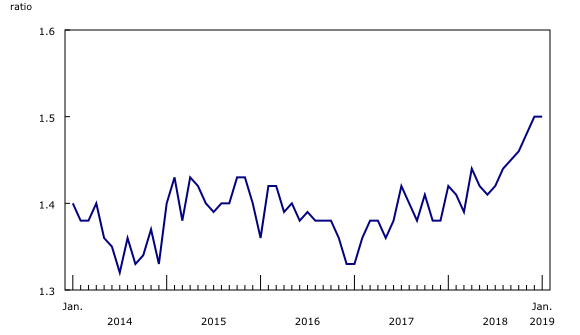 After two consecutive monthly declines, sales in Ontario rose 1.7% to $26.5 billion in January, mainly reflecting a 3.7% increase in the transportation equipment industry. The electrical equipment, appliance and component, as well as the furniture and related product industries, also contributed to the provincial gain. 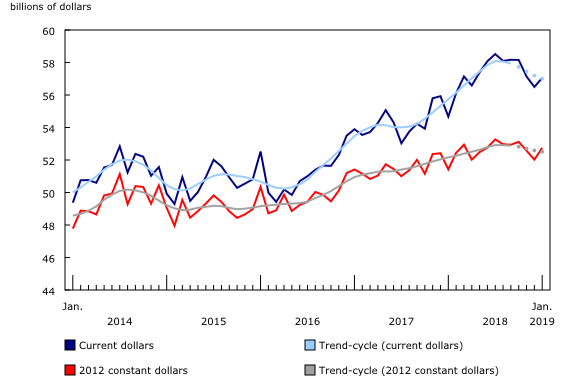 The second largest monthly increase in dollar terms was in New Brunswick, where sales rose 15.4% to $1.3 billion in January. This was the result of higher sales of both non-durable (+15.6%) and durable (+14.6%) goods. In Alberta, sales rose 2.5% to $6.2 billion, following two consecutive monthly declines. Sales were up in 12 of 21 industries, largely driven by a 13.8% increase in the food industry. Sales were also up in the wood product, fabricated metal product and electrical equipment, appliance and component industries. 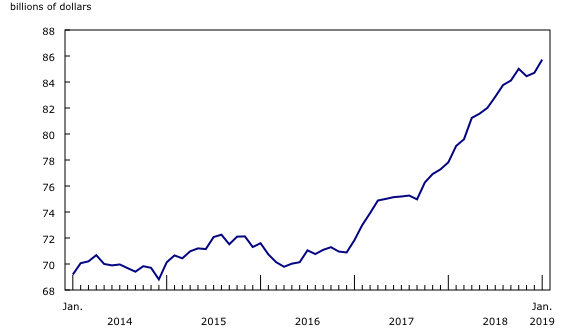 In Quebec, sales fell 2.8% to $13.7 billion in January, following two consecutive monthly gains. The decline was mainly attributable to a 23.0% decrease in the transportation equipment industry. Sales were also down in the paper, as well as the petroleum and coal product industries. These decreases were partly offset by increases in the chemical; food; and the plastics and rubber products industries. Inventory levels rose for the second consecutive month, up 1.2% to $85.7 billion in January. Inventories were up in 16 of 21 industries, led by the transportation equipment (+1.8%) and machinery (+2.4%) industries. The inventory-to-sales ratio was unchanged at 1.50 in January. This ratio measures the time, in months, that would be required to exhaust inventories if sales were to remain at their current level. Unfilled orders declined 1.0% to $102.6 billion in January, following a revised 7.3% gain in December that reflected new information provided by respondents. The decrease in January was mainly attributable to lower unfilled orders in the aerospace product and parts industry, as well as the other transportation equipment industry. 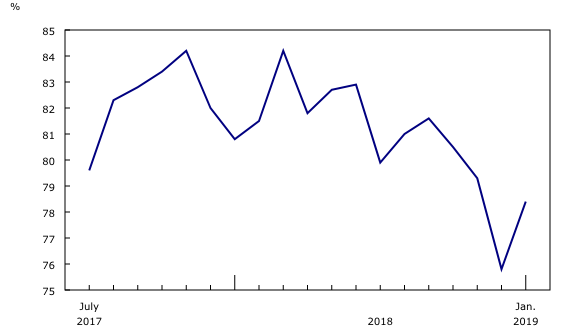 These declines were partially offset by an increase in unfilled orders in the computer and electronic product and the motor vehicle body and trailer industries. New orders fell 11.9% to $56.0 billion in January, following a 10.9% increase in December. 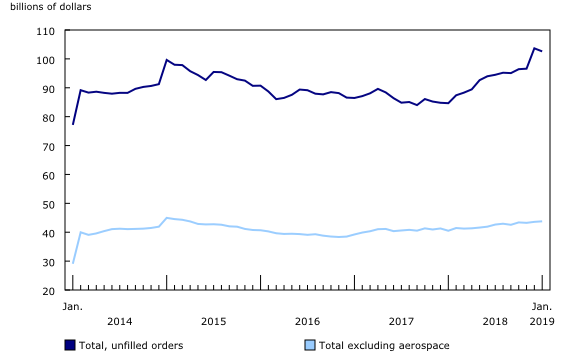 The decrease mostly reflected lower new orders in the aerospace product and parts industry. The decline in January was partially offset by higher new orders in the computer and electronic product and motor vehicle body and trailer industries. The unadjusted capacity utilization rate for the manufacturing sector increased from 75.8% in December to 78.4% in January. Overall, the capacity utilization rate rose in 13 of 21 industries, with the petroleum and coal product and transportation equipment industries posting the largest increases in January. After three consecutive monthly declines, the capacity utilization rate for the petroleum and coal product industry rose from 69.0% in December to 82.8% in January. This gain reflected a ramp up of production by several refineries. The capacity utilization rate for the transportation equipment industry increased 5.3 percentage points to 81.1% in January. A gradual rise of production at some motor vehicle and motor vehicle parts plants after holiday shutdowns was partly responsible for the increase in January. Real-time data tables 16-10-0118-01, 16-10-0119-01, 16-10-0014-01 and 16-10-0015-01 will be updated on March 25. Data from the Monthly Survey of Manufacturing for February will be released on April 16. To enquire about the concepts, methods or data quality of this release, contact Bechir Oueriemmi (613-951-7938; bechir.oueriemmi@canada.ca), Mining, Manufacturing and Wholesale Trade Division.